Since the Renaissance most Western painters have wanted to make it look as if the picture they are painting on a flat surface is three dimensional: has depth as well as breadth, just like the real world. There are many ways to create this illusion and this week we’re looking at one such visual device. In art what we call linear perspective uses – as the name suggests – line to create an effect of depth or distance. The key observation for the system of linear perspective is that parallel lines appear to meet in the far distance. 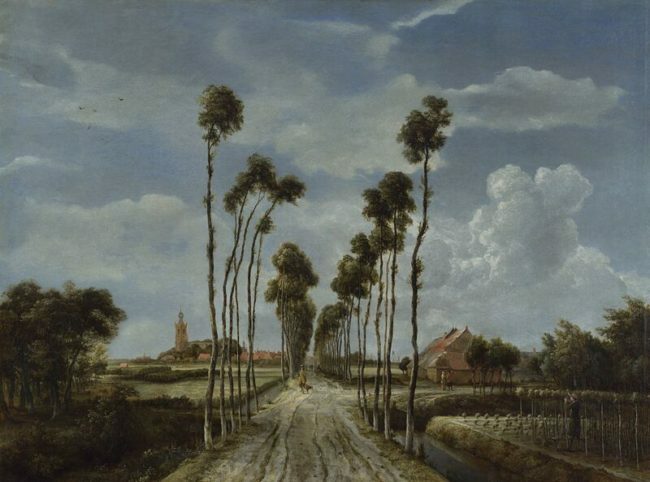 Take Avenue at Middelharnis (1689) by the Dutch Golden Age painter Meindert Hobbema: here the sides of the avenue appear to come together in the distance. And eventually they seem to join up. 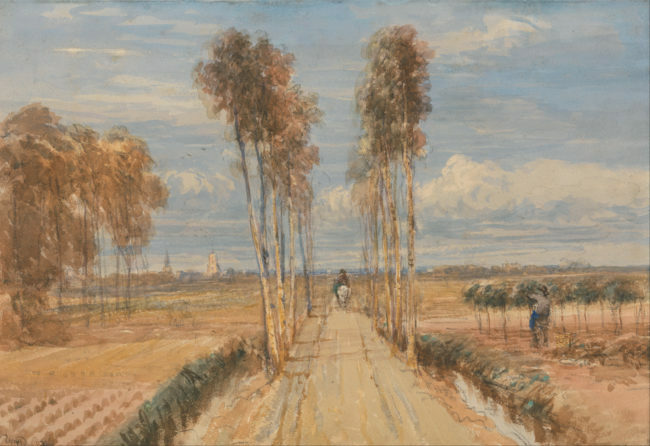 Like Hobbema, English landscape painter David Cox uses linear perspective in his watercolour Poplar Avenue (c. 1820). We know that the road sides do not actually meet but we interpret their converging in the painting as a sign of distance. By inserting a small figure on horseback Cox draws our eye into the painting and leads us down the road into the distance. 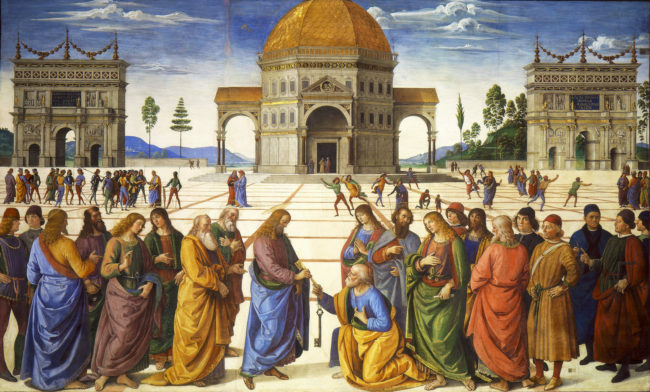 It is believed that it was the Florentine architect Filippo Brunelleschi who experimented with and formalised the system of linear perspective in around 1420. As we’ve seen, linear perspective uses real or suggested lines (often called orthogonals) converging on the horizon line or at eye level. 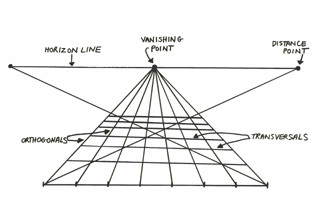 The place where the orthogonals meet is called the vanishing point. 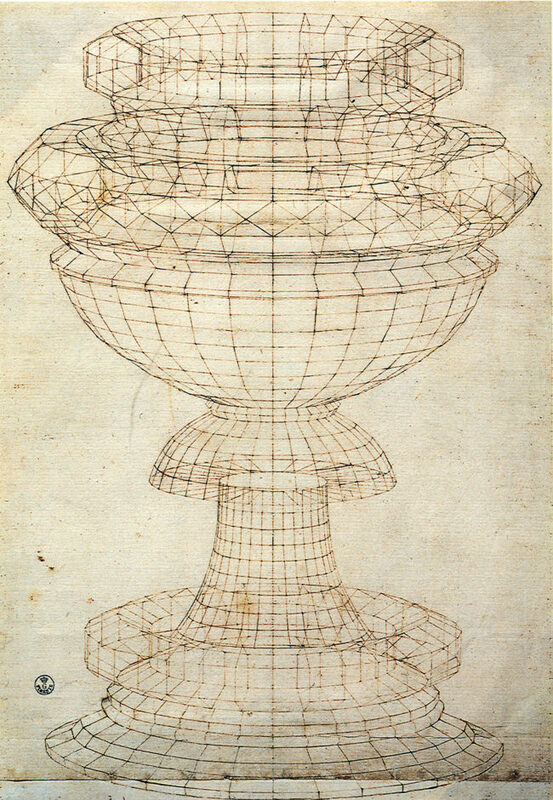 When linear perspective was “discovered” Florentine artists became obsessed with it, especially after detailed instructions were published in a painting manual written by fellow Florentine Leon Battista Alberti in 1435. 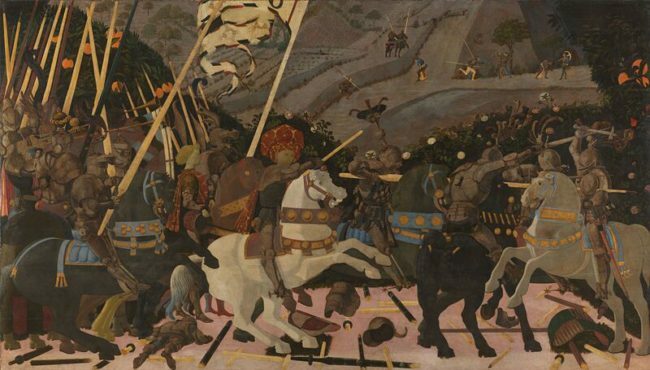 In this painting of a scene from the battle of San Romano (waged between Florence and Siena in 1432) the jolly trappings of the horses and rich colour scheme do not deter the eye from the obsessive way Uccello has laid broken lances and bits of armour on the battleground along the orthogonal lines. Linear perspective was revolutionary because it created an illusion of space from a single, fixed viewpoint (which fed nicely into the renewed focus on the individual that formed a key part of Renaissance thinking). The Renaissance soon came up with the comparison of a painting to a window, pointing to the painter’s ability to create a perfect illusion (with the help of perspective) of an outside reality, as if the picture surface were a pane of glass. 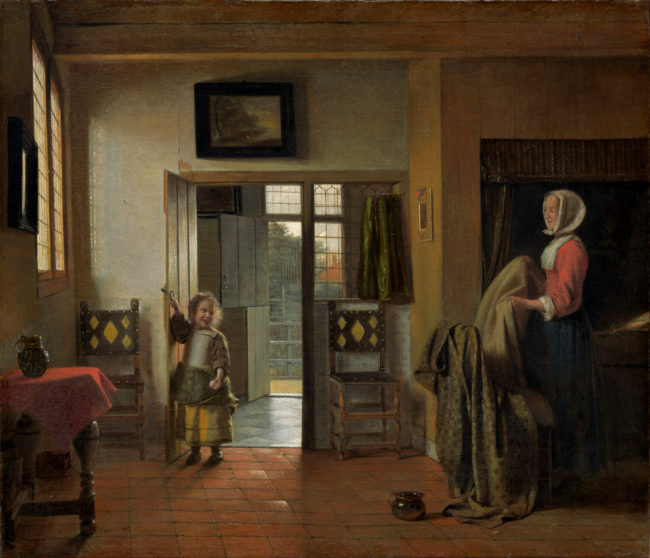 Pieter de Hooch (1629-84) creates a “window onto the world” in the complex interior of “The Bedroom.” Through a series of opening doors illuminated by a double light-source, he stresses his skill in building a convincing illusionistic interior space as the viewer is admitted into a private domestic moment. 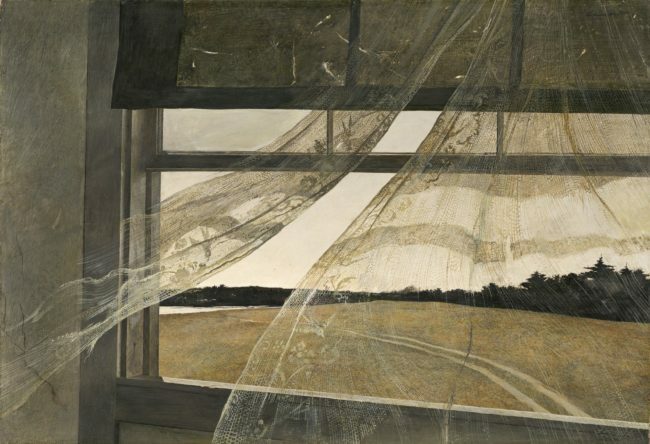 The American artist Andrew Wyeth (1917–2009) had a well-known fascination with the window motif: 300 or more works on this theme alone! His window paintings seem to insist on the idea of the canvas as a window onto the world. Wyeth’s repeated, painstakingly realistic renderings are reminiscent of Uccello’s dedication to his “sweet mistress perspective”. 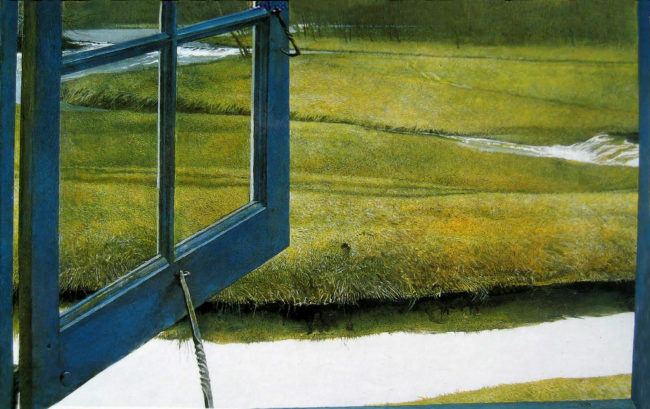 A Wyeth window rarely strays from the path of linear correctness (if “Love in the Afternoon” from 1992 above suggests something a little illicit then that has nothing to do with the by-the-book perspectival handling). 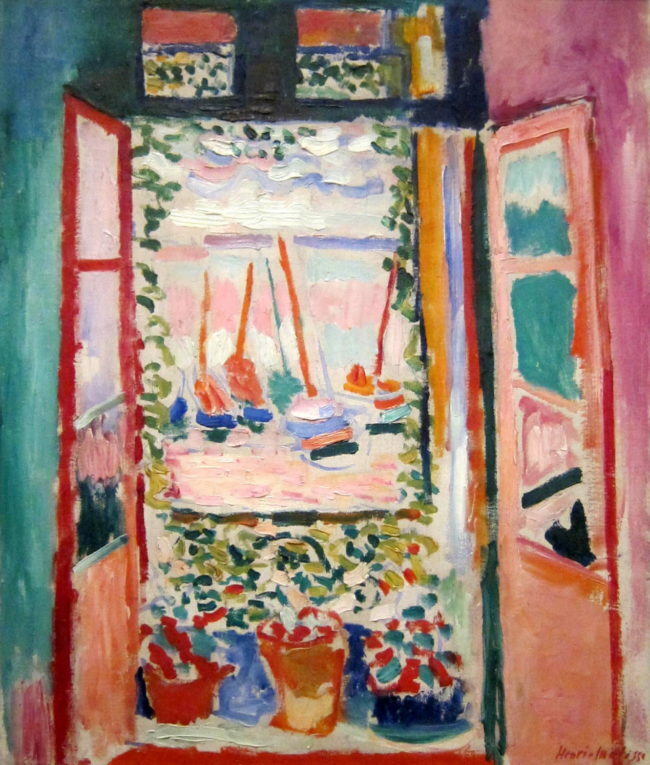 In this painting of a window looking out onto a harbour Fauve painter Henri Matisse did something very interesting with the Renaissance “window”. Open Window, Collioure (1905) is an invitation to look into the distance BUT any sense of recession is undermined. There are no “correct” orthogonals, much less a discernible vanishing point. Rather than looking into the distance, our eye remains trapped on the surface of the canvas by the bright colours and decorative brushstrokes. “The boat which is going past exists in the same space as the familiar objects around me… and the wall with the window do not create two different worlds” said Matisse. Linear perspective gave artists the formula for creating incredibly convincing illusions of space. It also gave Matisse and other avant-garde artists something to rebel against. And – if Vasari is to be believed – perspective even gave Paolo Uccello some nights of serious passion.